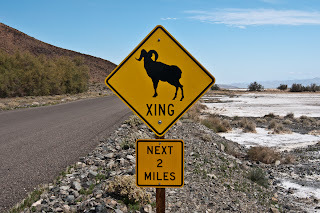 It was April, 2011 when I first saw the bighorn sheep crossing sign on Zzyzx Road, just outside the Desert Studies Center. However, in all my times exploring this area, I never actually saw any bighorns. That does not mean there may not have been any bighorns hiding up in the rocky hills, invisible to my poor eyesight. In September 2011 I had my then-closest bighorn experience at Willow Beach, just below Hoover Dam in the Black Hills of northwest Arizona. Having bighorns so close made for an incredibly exciting day. I did not get this close to wild bighorn sheep again for a while, having to settle for seeing bighorns only at long distances at Anza-Borrego. In early 2013, while recently doing some research on Zzyzx for other purposes, I was lucky enough to be placed into contact with someone very knowledgeable about the Desert Studies Center and Zzyzx area. On May 8, I asked him about the bighorn sign; asking him when was it actually possible to see any. 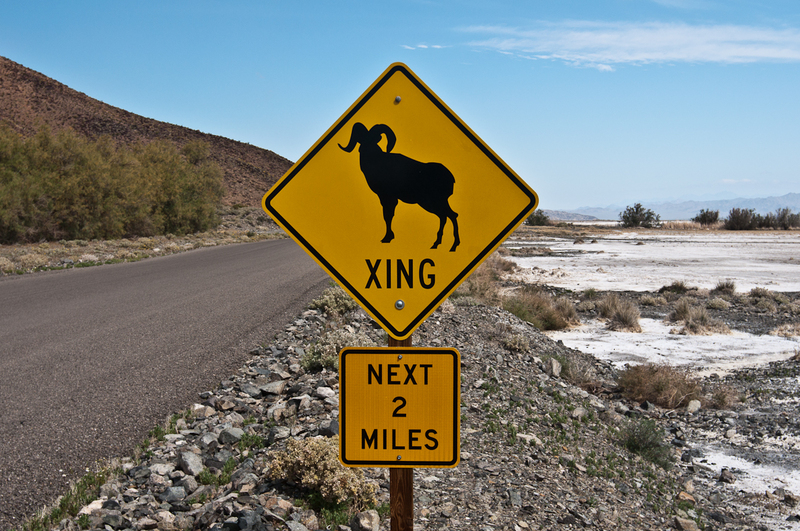 "see them daily now along zzyzx road. Groups of 25-35 on a regular basis..."
25-35 on a regular basis? Wow! So, off to Zzyzx I went that very weekend. When I got there, I almost super-hyperventilated (if there is such a thing) when I saw the herds of bighorns roaming around at road level, standing on the rocky hills, and hanging out in a marsh. A feast for lovers of the bighorn. Now, if this was not exciting enough, perfection followed. A lamb, maybe 2 weeks old, was making its way across the loose rocks of the hillside. It was followed by a ewe and tucked itself into a tiny cave in the hill. I've never seen them in that area either, but I'm going to next time I'm there. Which will be very soon! Its late in the season, not sure what you will see. However, with the rain they have gotten out in the desert, the animals must be loading up! !